Solid slab of Thujopsis dolabrata. 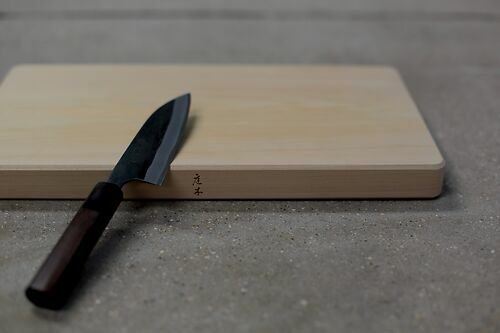 Hiba (Thujopsis dolabrata) is a conifer native to Aomori Prefecture in Northern Japan - it makes the perfect material for knife use as the timber is soft and forgiving to Japanese steel, and it's loaded with moisture-repelling oils that prevent saturation and ward off nasty bacteria as well as evil spirits. It also smells divine. Single, solid slabs of wood don't warp or split. Niwaki Tip: Allow to dry naturally after washing.